Make your hair long-term fresh and light! 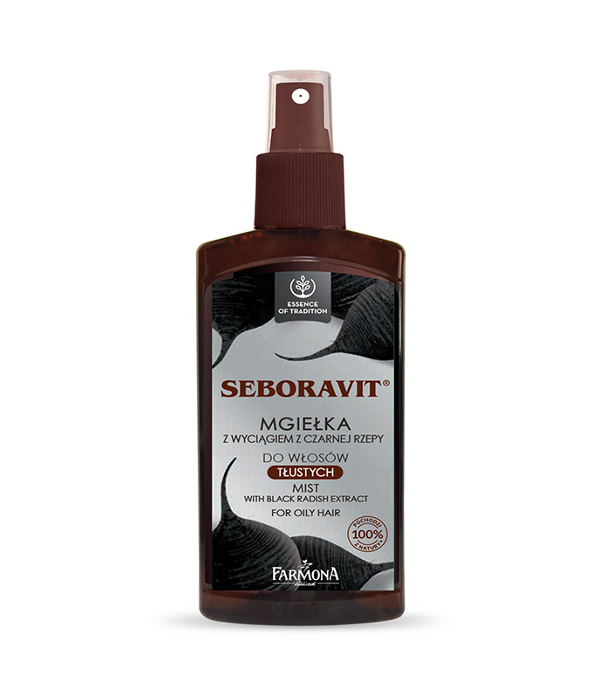 Seboravit® mist is based on a verified and effective formula. It is a result of a long tradition of using the unique properties of black radish. Spray on dry or moist hair. Do not rinse. Aqua (Water), Alcohol Denat., Raphanus Sativus (Radish) Root Extract*, Acorus Calamus (Sweet Flag) Root Extract*, Arctium Lappa (Burdock) Root Extract*, Panthenol, Inulin*, Silicone Quaternium-22, Polyglyceryl-3 Caprate, Dipropylene Glycol, Cocamidopropyl Betaine, Cetrimonium Chloride, Potassium Sorbate, Sodium Benzoate, PEG-40 Hydrogenated Castor Oil, Lactic Acid, Parfum (Fragrance), Citronellol, Hexyl Cinnamal, Butylphenyl Methylpropional.